The Organized Connection » How Do I Sort All Of These Papers? Paper comes at us from all directions. Paper sneaks in when we least expect it. Paper also builds quickly and surrounds us before we know it. Paper can impede movement, figuratively or physically. Paper is clutter, and it inhibits creativity, decreases productivity and prevents efficiency IF it is not managed. If you have a pile of papers on your desk, bags of papers all over your office, boxes of papers in your closer, or bins of storage in your storage, NOW is the time to deal with it! If you have a general idea of what type of papers you have, you can determine if you need to do a ‘thorough de-clutter and organize’, or a quick one. If you have a lot of financial documents mixed into the piles for instance, and they are not over 7-10 years old, then you will need to do a thorough job finding them. If you have wills or other important documents, again, you will need to do a complete de-clutter. If you have old magazines, articles, recipes, and the like, you have my permission to dump it all in the recyclables. I promise you can find that recipe online. 2. Determine your categories of your ‘stuff’; financial, marketing, clients, PR, expenses, or whatever is relevant to your situation. 3. Include boxes for shred, recycle and throw. 4. Get a bright sticky note at write the category on each one and tape to the box. 5. Surround yourself with your papers and address one pile, bin or box at a time. 6. Look only at the pile in front of you to avoid getting overwhelmed. 7. Then look at one piece of paper at a time. Determine its category. Toss it in the allotted box. 8. Stay with it for as long as you can. You will get in a grove and it will go quickly. Plus, when you are tired and sick of papers, you will be more apt to toss or recycle instead of saving unnecessary papers. 9. Make decisions quickly. Don’t over think the process. 10. When finished, take out the trash, recyclables and shredding immediately. 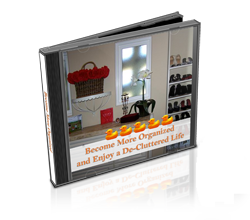 Your goal is to lighten your environment and clear out the clutter. For now, you are finished. Take a break. Don’t take too long of a break though; otherwise things will magically pile up again. Give it a week. In the meantime, when papers come in, automatically toss them into their labeled box. Next weekend you can begin sub categorization, filing and establishing systems.